Depending on your farm set-up, available equipment, and your willingness to purchase diesel fuel, your least-cost ration may look very different than your neighbors. Availability and proximity to co-product feeds, such as corn gluten feed (CGF) and dried distillers grains (DGS) may also shift your diet make-up. With supplementation, cows can actually digest more low-quality forage, up to 2% of their BW. Grain supplementation should be no more than 0.5 % of the cow's BW. If the forage is of such poor quality that more supplementation is required, you should consider using co-products to avoid negative associative effects that occur when using grains. The most economical way to feed cows is to keep them grazing. Brassicas and small grains with cornstalks can be used to provide fall and winter grazing very economically. 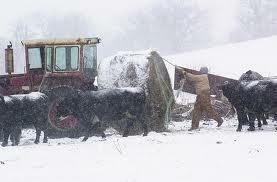 If the cattle need to be fed due to snow cover or other factors related to your farm, you should develop a low-cost method of feeding the cows. If your cows are thin or heavy milking, you will need higher energy diets than the examples. If your cows are larger than the example, they will need proportionally more feed.